Who participates in Love Our River Day Cleanups? Volunteers including families, service organizations, school groups, corporate teams, community organizations, and individuals like you. How long will I be volunteering? The short answer is 3 hours. While we ask all cleanup volunteers to arrive at the Cleanup on time, you may leave early if necessary. Please check out at Registration or with your team leader if you do. Love Our River Day Cleanups are usually scheduled from 9 a.m. – noon but the cleanup in your community may schedule a different time. When can I sign up for a Love Our River Day cleanup? Registration for our 2019 “Spring Cleanings” is open now. Registration for the September Fox River “Love Our River Day” opens on June 1, 2019. How do I sign up for a Love Our River Day Cleanup? Register for a Spring Cleaning or the fall Love Our River Day using the Cleanup Volunteer Registration Form at the bottom of the Love Our River Day webpage. All currently scheduled cleanups are listed there. The minimum age is six years old. We welcome parents and children who volunteer together provided there is one adult watching each child under ten. Parents with younger children who want community service to be a part of their family life are encouraged to bring younger children but we cannot register or insure children under the age of six. What will volunteers be doing that day? When you arrive at the registration location you’ll check in and sign a waiver. Coffee and snacks will be available. At the scheduled cleanup time your site’s organizer will welcome and organize volunteers into teams. You’ll get tools, gloves and trash bags. After a brief safety talk cleanup teams will go to their assigned area or stretch of riverbank and pick up trash and litter. At the end of the cleanup you’ll return to the registration area and check out. At most sites a picnic lunch and community river celebration will follow. 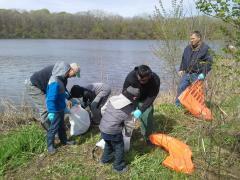 Love Our River Day cleanups will run rain or shine. Dress appropriately for the weather. In the event of thunder and lightning, sites will shut down for as long as necessary. If severe weather is forecast and any event changes are necessary you’ll be notified by email by 6pm on the Friday before the cleanup. What should I bring to a Love Our River Day Cleanup? Plan to bring the things you think are necessary for working outside in natural areas. Wear closed-toe shoes or boots, and comfortable clothes that can get dirty or damp. Dress to make sure you are comfortable and warm. If it looks like it might rain, bring a rain coat or poncho. We also strongly encourage you to bring water, sunscreen, and your favorite work gloves. Sturdy plastic buckets with strong handles are useful for collecting litter. Will you be providing gloves? Your site organizer will supply gloves, trash bags and other cleanup tools. We recommend bringing your favorite pair of work gloves with you if you want something sturdier. We cannot guarantee cloth work gloves for all volunteers. All volunteers need to sign liability waivers upon arrival at the cleanup site. Some sites may require an additional waiver other than the one you’ll sign at Registration from Friends of the Fox River. Minors (under the age of 18) attending on their own, or with a group, must print and bring a waiver signed by a parent or guardian if the parent or guardian is not attending. Friends of the Fox River cannot allow any volunteers to officially participate in an event without a complete waiver signed by an adult. who are participating in a cleanup as part of a group (school, scouts, etc.) may download, print, sign and send the waiver with their child.